There's nothing that can be written to sum up the United States of America. An enormous country stretching roughly 3,000 miles (4,800km) from the Atlantic to the Pacific Ocean, the US prides itself on being a melting pot of cultures from all over the world, and every big city in the country has its own Chinatown, Koreatown, Little Somalia, or Little Italy. These enormous cities, including New York City, Los Angeles, Chicago and San Francisco, offer world-class museums, shopping, restaurants and nightlife that have to be experienced to be believed. 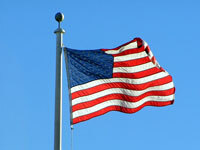 The US is a fairly young country, but its history is proudly displayed in monuments and museums. Travellers can see the Liberty Bell in Philadelphia, the Tea Party Ships in Boston, the iconic Mount Rushmore in South Dakota, and even view the Declaration of Independence in Washington DC's National Archives. It isn't all cities and sidewalks in the US, though; the vast plains contain a wealth of natural beauty. Ranging from the majestic Rocky Mountains to the calm serenity of Minnesota's Boundary Waters, the rugged Pacific coast of California to the endless 'Big Sky Country' of Montana, the scenery is astounding. Natural attractions are scattered throughout, including the 'Old Faithful' geyser in Wyoming's Yellowstone National Park, the giant redwoods of California, and Niagara Falls in upstate New York. The best time to visit the USA is between May and September when the weather is pleasant and the days are long. However, July and early August can be uncomfortably hot in most states, and many popular tourist attractions are overcrowded with families on holiday during this period. The weather in the USA varies widely throughout the continent, with the northern states seeing huge temperature changes between summer and winter, while the southern states remain fairly temperate in winter with hot summers. The best time for a skiing holiday in the USA is in late January and February when snow is guaranteed in most ski areas. Read more on USA Climate and Weather. -Enjoy stunning sunset views over the Grand Canyon in Arizona. -Meet Mickey and Minnie on a family trip to Walt Disney World in Florida. -Take a walk through Times Square and see a Broadway show in New York City. -Visit the Lincoln Memorial and tour the White House in Washington DC. -Walk across the Golden Gate Bridge and have lunch in San Francisco's Chinatown. -Take a wine-tasting tour of Napa Valley in Northern California. -Compare hand sizes with Michael Jackson and Marilyn Monroe at Mann's Chinese Theatre in Hollywood. -Go skiing in Colorado ski resorts like Aspen and Vail. -Hike in national parks like Yellowstone, Yosemite, or Adirondacks. -Listen to a Dixieland jazz concert at Preservation Hall in New Orleans. There is no shortage of direct cheap flights to the USA from the UK. Many cheap flights from London and Manchester go to busy hubs like New York JFK, Hartsfield Jackson in Atlanta, Chicago O'Hare and Washington-Dulles International Airport, however connecting flights are available to nearly any city in the country. Ragtime by EL Doctorow, Made in America by Bill Bryson, The Grapes of Wrath by John Steinbeck, On the Road by Jack Kerouac, and To Kill a Mockingbird by Harper Lee. Louis Armstrong, Nirvana, Aaron Copland and Scott Joplin. Glory (1989); Pulp Fiction (1994); The Good, the Bad and the Ugly (1966); Forrest Gump (1994); and Mr Smith Goes to Washington (1939). Napa Valley wine, hot apple cider, and local microbrewed beers. Southern Barbecue, Philly cheesesteak, and Chicago-style deep dish pizza. I (Heart) NY items, Hollywood celebrity souvenirs, Mickey Mouse Ears, and replicas of famous monuments. Other souvenirs include Native American crafts, Vermont maple syrup, Californian wine and local fashion. Comfortable walking shoes and a light jacket in summer, or the warmest clothes possible in winter. Bring a good map or download a reliable map app to help you get around in big cities. The Tournament of Roses Parade fills the streets of Pasadena with enormous floats made of flowers. Boston throws a 4th of July party like no other with fireworks and symphony concerts. St Patrick's Day in Chicago includes a huge parade, and they even dye the river green. The National Cherry Blossom Festival turns many of Washington DC's parks bright pink. The Macy's Thanksgiving Day Parade in New York City is attended by tens of thousands of people each autumn. Racing highlights in the US include the Kentucky Derby and the Indianapolis 500. -Montana has three times more cattle than people. -Alaska has a longer coastline than all the other 49 states put together. -New York City was once the capital of the USA. -Missouri's nickname is 'The Show Me State'. Stretching between the Pacific and the Atlantic Ocean, the vast territory of the USA contains jagged mountains, majestic forests, world-class cities, and charming small towns. This is a holiday destination that it would take a lifetime to fully explore.